Find My Workspace lists over 95% of the serviced offices & coworking space market in Fortress Hill. Simply click Request Quote to check pricing for one office, or Add to Basket for multiple offices. This brand new coworking centre, located in the heart of Hong Kong Island has an early bird offer available. 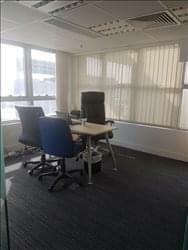 With options for hot desking, private rooms and virtual office options, this space can cover a variety of unique business needs. The centre has a spacious, contemporary style, with 24/7 access for members via an advances access control system. The spaces offers members both a high-speed WiFi and broadband connection with an exclusive leisure area and a terrace for relaxation. This centre offers 15 individual desks in a communal office space each with their own locked drawers and landlines. The space offers members access a glass enclosed meeting room, big enough for 3 people with locked drawers, landlines and a personal printer. In addition to that, there is a larger meeting/showroom space, glass enclosed with enough space for 8 people. The whole office is furnished and air conditioned, has wifi, two printers, a kitchen, private toilets and a storage room. The building the office is in also has a business centre where you can hold meetings with clients which also has free tea and coffee. There is a lift to take you up to the 20th floor. To obtain information for your selected Fortress Hill Serviced Offices & Coworking Space, please tick the "Add to basket" box for each office you prefer and complete the form below. We will then send a detailed report via email.